This serene and intimate boutique hotel in Waikiki offers an oasis of calm in the heart of Honolulu. Mere minutes away from top Waikiki attractions, the hotel is home to an exceptional array of contemporary accommodations, pampering services and fine amenities. 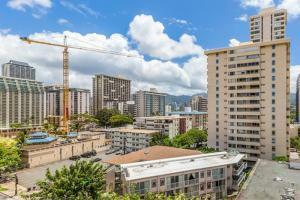 Two blocks from famous Waikiki Beach, world-class dining, shopping and attractions are all within a short stroll. Approximately 30 minutes from the Honolulu Airport. Eco Tours, Sailing, Scuba Diving, Parasailing, U.S.S. Arizona Memorial & Pearl Harbor, Historical Iolani Palace, Chinatown, Waikiki Aquarium, Ala Moana Shopping Center, Kodak Hula Show, Polynesian Cultural Center.